New Savannah Notes are Finally Here! 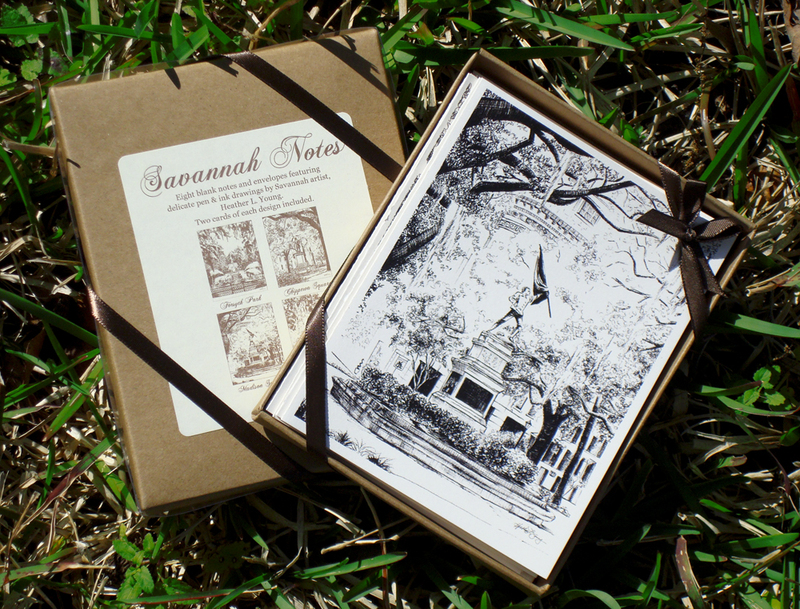 If you’re local to Savannah, you may have spotted them already at ShopScad, The Tea Room, or La Paperie, but now you can also get your Savannah Notes online via The Ink Lab. I’ve mixed up the series a bit and revamped the packaging to include an eco-friendly kraft paper box. 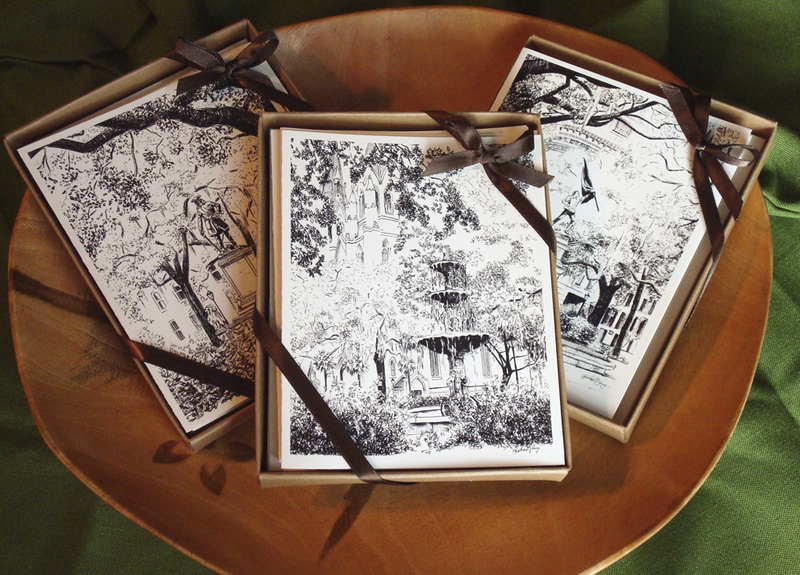 Each box includes 8 notes featuring my pen & ink drawings of Madison Square, Lafayette Square, Chippewa Square and the iconic Forsyth Park Fountain. Get yours here! Hope y’all are enjoying a beautiful Savannah Spring! 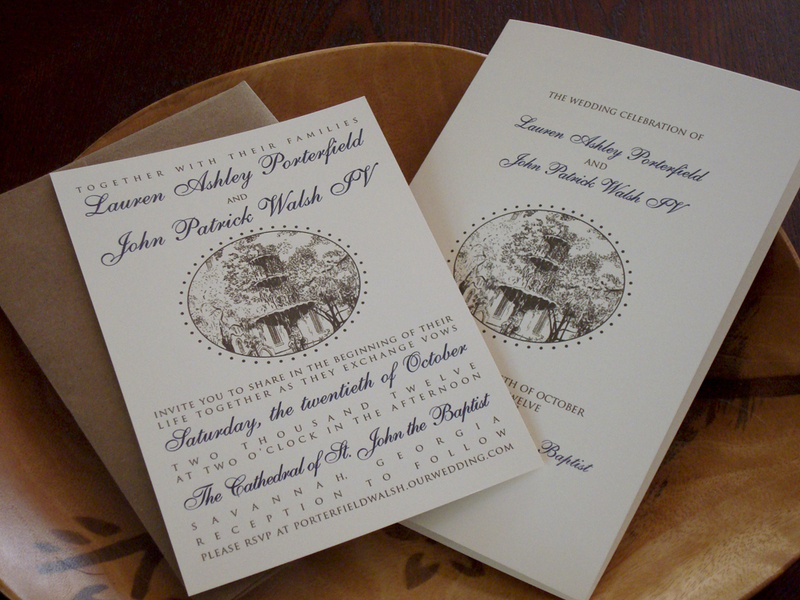 Savannah Lafayette Square Wedding Invitations and Programs – Perfect for Cathedral Ceremonies! I’m sure there are those that will debate me on this, but Lafayette is hands down, my favorite of all the Savannah Squares. I adore the patina on the fountain, the beautiful oaks that surround it, and of course the company it’s nestled between: The Cathedral of St. John the Baptist, Hamilton-Turner Inn and the Flannery O’Connor Childhood Home. Happy Wedding Day Lauren & John! It was such a pleasure working with you and thank you for giving me the opportunity to work with one of my favorite squares, Lafayette. I loved Lauren’s color scheme of Eggplant and Chocolate Brown and it paired nicely with the rustic kraft paper envelopes. Really pleased with the way these turned out. Tea length, with inner and outer envelopes in ecru. Opted for script vs. print. (to which I was thrilled) Printed with archival inks onto fine art paper, and then delicately cut down with sharp x-acto. All the best to the lucky couple and (if you’re reading this) many thanks for a fabulous project! I’m really excited to bring these to life. 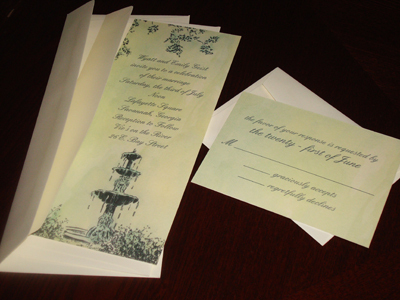 A variation of this print, I love that they are going for a tea length invitation. I’m also super stoked to be doing custom wedding invites for not one but two brides right now! Gives me a chance to relive all the fun I had planning and designing our own special day…(without a fraction of the stress!) 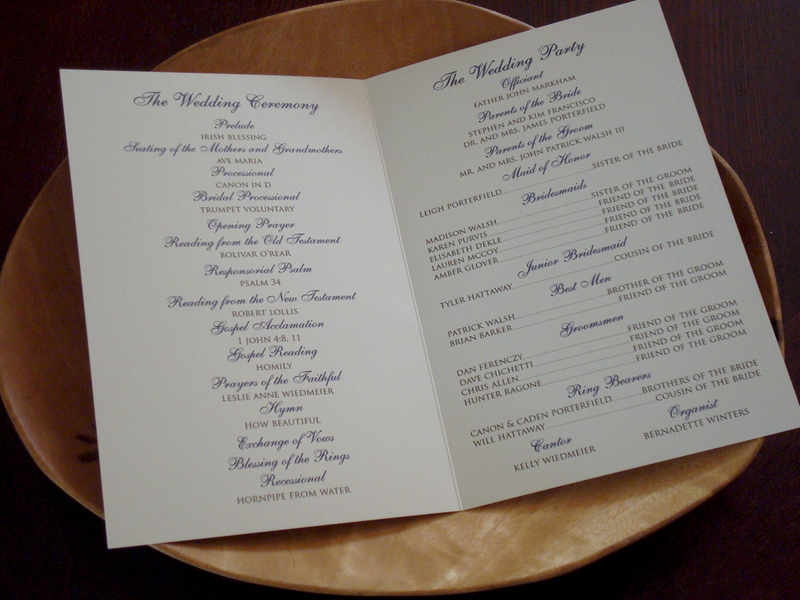 I can print with archival inks on a variety of luxurious papers, and I thrive on custom work…So keep em’ coming people! Early morning paint session today. Adding washes to these always brings me back to summer visits at Granny J’s. 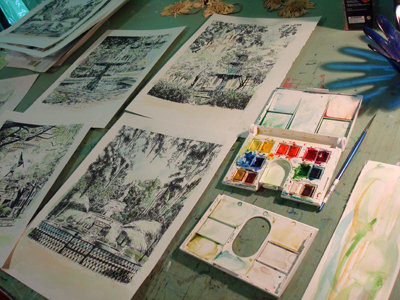 She ALWAYS had a Paint with Water book to keep me occupied. Shame you don’t see more of those around today. Of all the Savannah Pen & Ink sketches I’ve done over the years, this one has always been the favorite. I love the sneak peak of St. John’s Cathedral through the trees, and I sure hope I’ve done it justice by adding a splash of color…feel free to critique! Oh and to refresh your memory, here’s the classic black & white version.